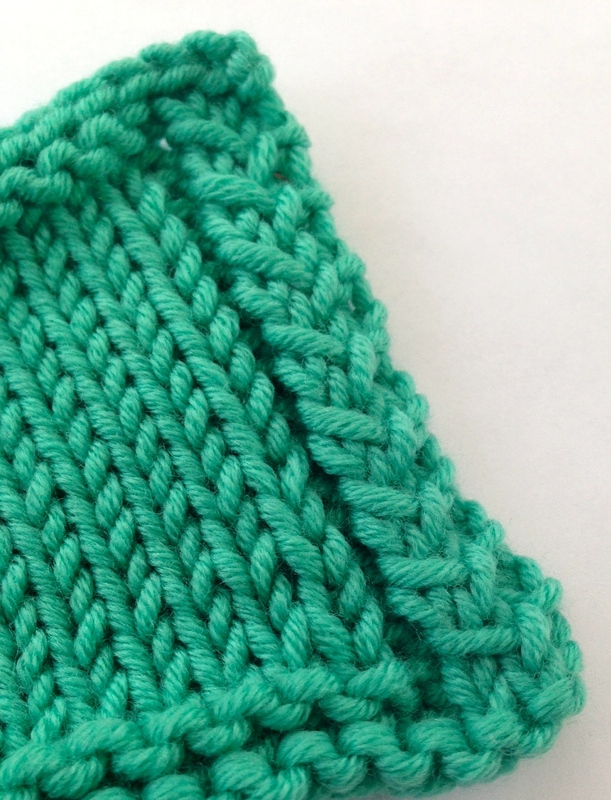 This pretty Hatch Edge won’t bully your knit fabric like Garter. This should be a short post because a picture is worth several hundred blog words. Garter edges are popular for their non-rolling properties, but they also have a very different row to stitch ratio than stockinette. Garter is a squat, condensed stitch compared to stockinette, which is why the two really don’t play nicely together. It’s the bully on the kindergarten playground forcing stockinette out of shape. So what to do if you don’t want your edges to roll? How about trying our Hatch Stitch Edge? It doesn’t warp the knit fabric, it reduces rolling and it’s pretty too! There are 4 stitches in this edge, but as you can see in the picture, they don’t take up much width. Really no more than a 2-stitch garter edge. When blocking, you’ll want to turn your project over, run your fingers down the back of the two hatch stitches to open them up, then spread all four stitches out to lie flat while drying with the right side up. We used it on our Manchester Scarf just published as part of a free e-book. These patterns are designed for you to test out some of our favorite new techniques so just pop on over to Ravelry to download the pattern and give it a try. The Manchester Scarf pattern has two “Nuances”; the Hatch Edge and perfectly matching right and left leaning Showy Decreases. You’ll find this edge in several of our upcoming projects as well. Don’t limit your ideas on where to use it to scarves and shawls. How about sleeveless shells (hint) and v-neck edges (hint, hint). Watch this tutorial video on our You Tube Channel for help with the Showy Decrease and Hatch Stitch Edge. Isn’t social media an interesting thing? When I wrote this post, the edge was a detail on the Manchester Scarf announcement and a tease for the Fiftyfifty Shell about to be published in Knitty. The ‘real’ story was the matching Showy Decreases and the free pattern in Ravelry. However, this ended up being our all time most visited post, with over 25,000 views thanks to Pinterest and Knitting Paradise readers. Now that it’s turned into so much more, I’ll add the stitch pattern right here for your convenience. I still encourage you to knit the scarf, it’s simple and fun to see the impact that knitting Nuances can have on your projects. I recently had a request for a Hatch Stitch Boarder. 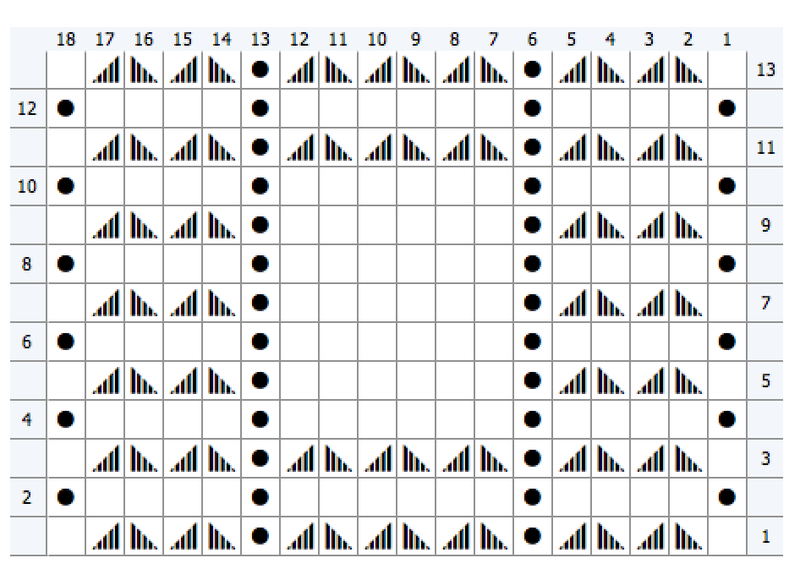 I haven’t had time to knit one up but here is the chart showing 2 repeats on all sides. You can add as many repeats as you like. The purl column has been retained to help prevent side rolling. Want to try another non-rolling edge? We just announced a new one. You can read about the Showy Ridge Edge in this blog post. And even better! There is a free Nuancing Your Edges download for our blog followers! It includes 3 non-garter edges in an easy to print PDF file. Yes, 3 edges so you are getting a sneak peek at an unannounced edge. I think ya’ll are wonderful & I posted your site on http://knittingparadise.com the other day. As of today, 3621 views. As of 12/12/16, 4716 views!! I think about forty percent of knitters are very neat when it comes to edges and the remaining sixty percent have troubles. I have loopy edges. I do a normal in pattern edge garter or stocking. I just cannot gor love nor money get the tension for my edges right. Too tight or too loose. So I took advicd to slip first stitch. Humm bigger loops that sit next to two rows. Humm talk a.out a solution worse than the problem. Do you have any advice to help please a vety flustrated knitter. Is the e-book still available for download… There was no link on the ravelry site. 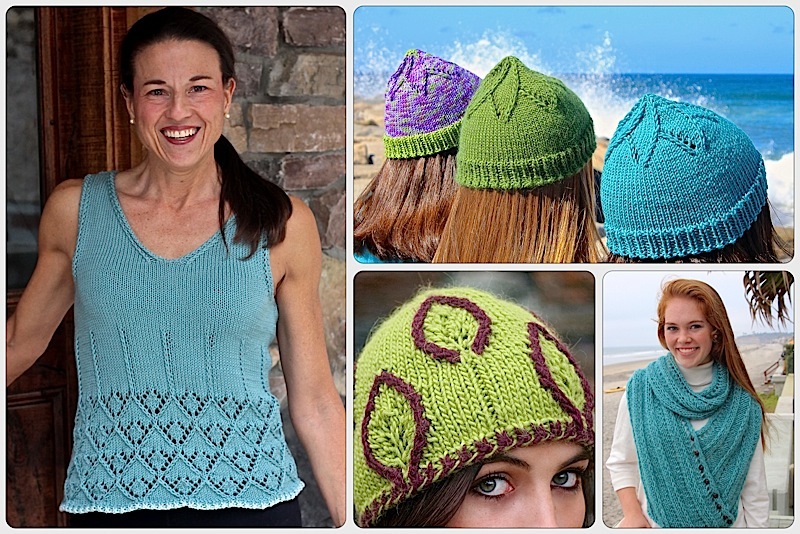 The 3 patterns tied together in a collection that Ravelry calls an eBook. The link above should bring you right to the page with the 3 patterns. You can also search for the Manchester Scarf and it will show it is part of the collection. Hope that helps! I would love you to give us the option to share your work on Pin It . We need to share your great blog. Thanks for asking. Yes, yes, yes! Share away. One of my primary goals is to share these ideas. We do have a Pinterest account also. Laura, If I use the hatch stitch across the bottom & top of a blanket for about a 1 1/2 inch height, how would I increase the hatch stitch on the side edges of the blanket to match the 1 1/2 inch top/bottom of the blanket? Can’t seem to figure this out. Maybe just brain dead today. Thank you for your time. Laura, if I use the hatch stitch for the bottom and top borders of a blanket and knit the border to a 1 1/2 inch height, how would I increase the hatch stitch edge sts from a 4 st edge to match the 1 1/2 inch top/bottom border? Thank you for your time. Catherine, On the standard Hatch Edge I add a purl column to help prevent rolling. You could do the same thing on the blanket and run that all the way from bottom to top. I can’t add a chart picture here so I will go back and amend the post with a chart at the end. It will show 2 hatch sets on the bottom, top and sides but you can repeat as many as you like. Hi Pam, Let’s see if this helps. There are 4 stitches in the edge. 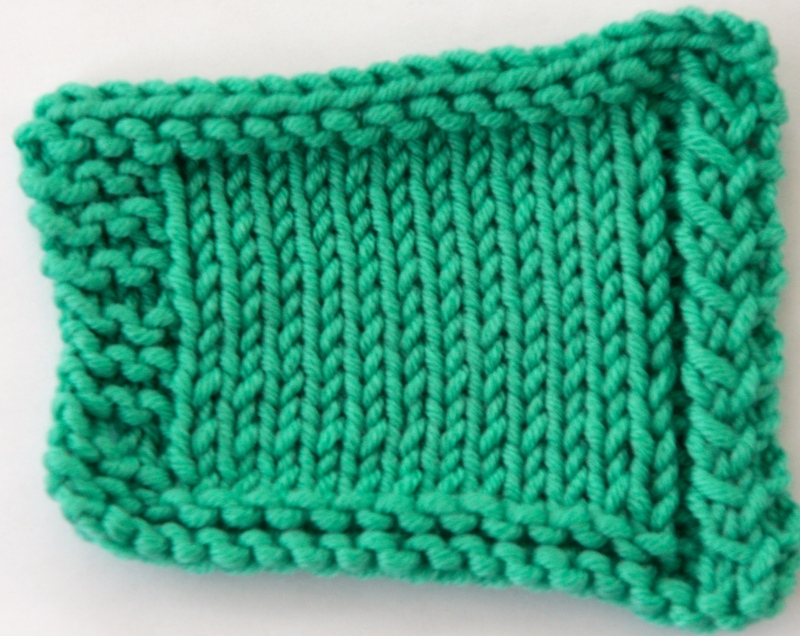 The outside stitch is knit on both sides creating a bump. The inside stitch is like a rib and set the edge into the fabric. The middle 2 stitches are shown together on the chart since you start and end with 2 stitches. For those two you: slip 1st stitch, yarn over (plus 1 st), knit the other stitch, then pass the slip stitch over (minus 1 st). Your instructions have helped clarify things after some more trials. Am I right in saying though it would be more correct to say that it is the “yarn over” that is passed over rather than the “slipped” stitch or am I still doing it wrong? and does it matter if the slipped stitches are done purlwise or knitwise? Pam, You are correct in that I was doing it one way and then like the other better. I’ll go back and find the inconsistent version and change it. No, still struggling with this even more now! On the RS of hatch stitch of version Slip 1, K1, yo) pass slip st over both the knit and yo -when passing over at both ends can’t form a “single” stitch .Am I supposed to have 2 threads in one and work as a single stitch? Sorry……. 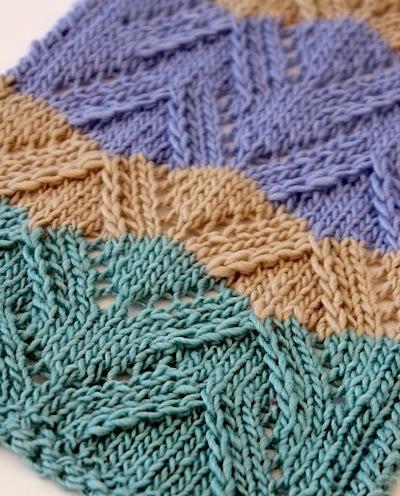 This entry was posted on March 10, 2014 by Laura Cunitz in Edges, Nuances and tagged knit edges.